I left my career as an elementary school teacher in June of 2018 to go full-time in my product-based business. A lot has changed since then (more on this later), and I’ve had quite a bit of time to reflect on the last couple of years of running my first business — I faced a lot of challenges, especially in the beginning, and I see so many women who are currently where I once was not that long ago. I didn’t have a professional coach or mentor, nor did I have any loans funding my little hobby turned online business; I started my brand in my parents’ kitchen on a random night after work and truly, from that moment, the rest was history. Looking back there are plenty of things I would have done differently, but there were so many important lessons and experiences I wouldn’t have had otherwise. This post is for all the women who are currently working their asses off to turn their online business dreams into reality — and need a little push to keep them going on that journey. Full disclosure — I was really, really, really awful at marketing. It took a lot of tears, frustrating conversations with my significant other, late nights combing through every resource I could find, and lots of patience to finally get a grip on marketing. The truth is, you can have the most incredible product but if you’re not working on marketing your business and giving people a reason to buy from you, it will be reflected in your sales (or lack thereof). Remember that. We are often tempted to have this mindset of “build it and they will come” (I know I did at first), but you have to work on bringing people to you. In rare cases, people may randomly stumble across your social media or your website, but 99.9% of the time you have be taking actionable steps to get your future customers to your online store. There are so many facets to marketing an online business — SEO, social media, Pinterest, emails, cold-calling, in person networking — the list seems endless and extremely overwhelming at times. My best advice: if you go the DIY route with your marketing, find out where your target market is hanging out the most and focus on one or two areas to begin with so you don’t overwhelm yourself. Get really good at marketing your brand in those two areas before you add another method to the mix. If you can afford to outsource your marketing, I highly recommend hiring someone to do a lot of the leg work for you. There are plenty of Virtual Assistants, SEO Experts, and general marketing strategists out there that are more than willing to help you at a variety of different prices. Alexa from Healthy Dash of Social is a digital marketing genius, and I totally suggest you check out her services if you need someone to help you out. Outsourcing takes a lot of the pressure and work off your shoulders, so you can focus on the other important tasks of running your online business. Whichever route you choose to take, know that marketing is absolutely essential to growing your brand. In the same thread of marketing, you need to establish an email list as early on in your business as possible. I started my email marketing system so late in the game, and that is one of the things I wish I would’ve had in place right from the get go. A lot of people roll their eyes at this piece of advice, but you’ve got to start getting people on your list — even if you haven’t officially launched yet. Why? Simple: you do not own your social media. If your account is hacked or a glitch happens, you can lose everything, easily. In addition to that, with the way the algorithms work at times, your content is not always being seen by your followers. You want to have a quick, convenient way to get directly in front of your target market — current and future customers alike — at any given moment, and e-mail marketing is the best way to do that. In the beginning I used MailChimp for my email marketing, but switched over to ConvertKit as I found it was much more organized and user-friendly; now, 9 times out of 10 I always recommend starting with ConvertKit. You can sign up for a free trail to start, and then choose a plan according to your preferences (and budget), when it’s time to upgrade. If you want to find out if ConvertKit is right for you, this article is super helpful and can help you decide if it will meet your needs. For example: The incentive I’m offering you in order to collect your email address is the freebie (an e-book). The opt-in form is where you enter your email address to get access to the freebie. A stand-alone opt in page might look something like this, and can be created even if you don’t have a full website just yet, but want to start collecting subscribers. A stand-alone opt-in page can be created within your email marketing provider, who will then supply you with a unique link to share with your customers. Your incentive may vary depending on what type of business you have (or aspire to have). It may come in the form of discount codes, free shipping, e-books, informative articles, exclusive access to a subscribers-only membership portal, etc. If you do some digging around Pinterest or Google, you can find a long list of suggestions for possible incentives that make sense for your industry. Just keep in mind that most of the time, your customers aren’t just going to give you their address without knowing they’ll get something in return. Take some time and really think about what you will offer them. I promise I will have a full post dedicated to email marketing soon, because it’s a topic that a lot of entrepreneurs (and bloggers) wonder about. For now, just know that you should (1) choose an email marketing platform (2) create your opt-in form or page (3) offer/create an incentive and (4) deliver valuable, consistent content to nurture your list and keep your subscribers happy. While the context from this quote originally came from an article about attracting clients, it also holds true for product-based business owners: If you think you’re selling to everyone, you are selling to no one. Your products will. not. be. for. everyone. That’s just the reality — and that’s totally okay. You just need to figure out exactly who you are selling to. You need to get incredibly clear and incredibly specific when defining your ideal customer avatar. Who are you selling to? Why do they NEED your products? What problem are you solving for them? How old are they? Where do they live? What do they do for a living? (You’ll find a full worksheet in this free e-book to help you discover your ideal customer). You have to step outside of yourself, the business owner, and step into the mind of your ideal customer. Your products are for them and they are handing over their money to you. Take care of them, get to know them, and market to them. One of the most difficult things in the beginning stages of my first business was determining prices. I worried that if my products were too expensive, no one would buy them, and if they were too cheap no one would see the value in them and I wouldn’t make any money. Initially my first instinct when I wasn’t making any sales was to decrease my prices, so I went ahead and cut my prices nearly in half as a desperate attempt to get more customers. The result? I barely broke even during that time. In fact, I’m pretty sure I lost money when I slashed my prices. People weren’t flocking to my store like I hoped they would. When I finally started charging what the products were actually worth, that’s when I realized I didn’t have to drop prices to bring in customers — people would actually pay the higher price if my marketing was in check. You need to dig really deep into the numbers here — know how much your products cost (whether you make them yourself or purchase wholesale), how much you put into making/packing/shipping your items, factor in any of your overhead costs, and decide how much you want to earn (your profit per item). There are plenty of resources out there to help guide you through determining your cost of production and your prices no matter what industry you’re in; I was lucky enough to have a financial analyst for a significant other to help me work through this process. A great price of advice I got early on in my first entrepreneurial endeavor was to create a lifestyle around my brand. This is where defining and understanding your ideal customer avatar really comes into play, and how it connects with your marketing strategies. Show your products in action. Curate a social media feed that is appealing to your target market and showcases your brand. Provide your audience with valuable, engaging content and give them a reason to need your products (or services). Sometimes it’s crystal clear on how you can develop your brand’s lifestyle, sometimes it isn’t so easy. Take some time to really sort this out. I recently wrote a blog post about how entrepreneurs can work with influencers based on my experiences with my product-based business and as a micro-influencer myself. Using influencer marketing is a great way to get your brand out there and build a loyal customer base, but there are a few things to consider before you publish a post in a Facebook group asking for volunteers to review your products. When you go into influencer marketing blindly, you end up sending out a ton of free stuff with very little return, so you absolutely need to do your homework first. I highly suggest reading that post before you start collaborating with influencers, or even if you’ve already done some collaborations in the past. Regardless, don’t hesitate to reach out after you do some research on who would be a good fit for your brand! Keep. it. simple. This was a hard lesson learned for me. Early on I thought if I offered more it would bring in more sales, but all it did was stress me out, put me in the red, and spread me way too thin. I’ll go as far to say that it made me hate my business at times. You need to get really, really good at making and selling what you currently have first; then later on down the road once you’ve built up a loyal customer base and have your feet under you more, you can gradually introduce new products if the time, price, and demand is right. My dad has ingrained the importance of networking into my brain for as long as I can remember, and I guarantee you he attributes much of his success to this very principle. Grab yourself some business cards, hit up local events in your area, talk to the stranger at the coffee shop, tell people what you do — it doesn’t matter where you are or what you’re doing, there are always opportunities to build new, meaningful connections and solidify existing ones. You truly never know what could come from a simple conversation with the person next to you. My favorite place to network online is inside Facebook groups. I’ve met so many incredible people within these various groups who have purchased from me, signed on as clients, and even purchased inventory at wholesale rates. I started a community for creative, entrepreneurial women that you can find here, but if you want to search for additional groups to join, I highly recommend browsing Facebook. I’ve always had a pretty crappy mindset, but towards the end of my teaching career, I slowly started to realize that I could re-wire my self-sabotaging brain to think differently. Running a business will test you emotionally, physically, and mentally, so loading up on personal development is incredibly important. If you don’t think you will succeed in your business, you won’t. Plain and simple. If things get really difficult and you can’t see yourself pushing through those challenging moments, you won’t. If you think you can succeed, however, you will. If you believe in every fiber of your being that you are destined for success and financial abundance, you are. That’s not to say we don’t have moments of self-doubt from time to time, but your resiliency, how you react to challenges, and how you bounce-back says a lot about your state of mind. Your mindset is a powerful tool: feed it, nurture it, and treat it gently. You can find my favorite personal development books for entrepreneurs here. Ah, my least favorite lesson of them all. I am not a patient person; and in a world where instant-gratification runs rampant and so many things are literally at our finger tips, patience is a difficult virtue to possess. Building a business takes a lot of time, and success just isn’t going to happen overnight. It’s so hard to be patient sometimes but you have to put your head down and keep at it. Keep providing value, building connections, and working on your marketing. Starting and running your own business is not for the faint of heart — it will test you, break you, make you cry, and you will absolutely have moments when you ask yourself 'wtf am I doing! ?’ but it will also show you how resilient you are. It will teach you important lessons, provide you with new, exciting opportunities, and maybe even uncover new skills and strengths you never would’ve noticed otherwise. If you’ve made the brave, bold decision to start a new business, if you’ve finally committed to transforming your candle-making hobby into a full-blow brand, or if you have taken the leap and left your career to be a full-time entrepreneur — I commend you. In a lot of ways, you’ve already done one of the hardest parts, and I’m proud of you for that. My inbox is always open if you want to chat, or just need some positive vibes sent your way. What are some important lessons you’ve learned running your business? I don’t know about you, but January tends to be a slower month for me in my product based business -- many people are recovering from the holidays and don’t have a ton of extra cash to spend. As a result, my sales significantly drop for the first few weeks of the new year. 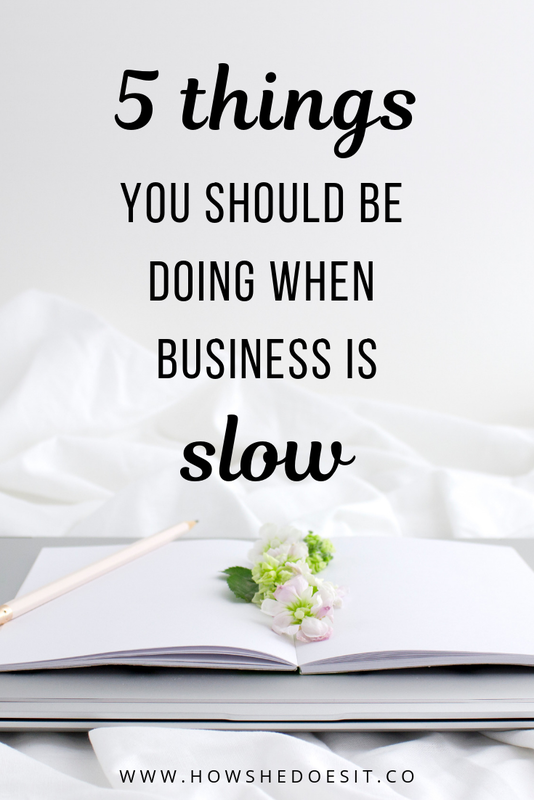 While this may seem discouraging, it’s a pattern that I’ve noticed in one of my online businesses, and through talking with some other entrepreneurs, it seems some other people experience this beginning-of-the-year lull. When I say content creation, I really mean a variety of things. Content creation can come in the form of product photography, curating and scheduling social media posts, adding blog posts to your website, and everything in between. When things are busy, I don’t have as much time to take photos and manage my business’ social media as often as I’d like. During slower weeks or months, I like to round up some solid photos, edit them and then schedule them to upload to social media. My favorite tool to schedule social media posts (specifically for Instagram), is Tailwind. I’ve talked about Tailwind before as a helpful tool to use in conjunction with Pinterest, but it’s really incredible for Instagram too. They’ll determine the most optimal times for your posts to publish to your feed (which go up automatically without you having to do any verifying), and their hashtag feature really takes everything to the next level to help you reach more people in your target market. It’s super easy to navigate and you can essentially schedule out several WEEKS worth of content in a few hours, saving yourself tons of time in the long run. If you want to check out Tailwind for yourself, you can sign up here or read more about it in this post. Who else gets overwhelmed with email lists!? I feel ya. While I fully recognize and often preach about the importance of establishing a solid email list, it’s something I struggle to keep up with when things get super hectic. Slow seasons are the perfect time to get your email marketing under control and set up some solid automated campaigns so things can run on autopilot behind the scenes. In the past, I’ve used MailChimp for all of my email marketing but after doing some serious reflecting and research, I’m finally making the switch to ConvertKit. MailChimp has served me well the last couple of years, but I’m ready to take my email marketing to the next level (and in a new direction), and know ConvertKit can help me do that. A huge part of me wishes I would’ve started with ConverKit in the first place (more on this later), but I’m looking forward to making the switch and sharing more details about my ConvertKit experience with all of you so you can make the best choice for your business. If you want to give ConvertKit a try and see what the buzz is about, you can sign up here. When business is slow, it’s the perfect time to ramp up your Pinterest game. Take some time to make sure your business account is set up, create some branded graphics in Canva, and start scheduling your content via Tailwind. Pinners are coming to shop, so it’s important you’re spending some time building up your Pinterest skills and content when business is slower than usual. For as long as I can remember, my Dad has always stressed the importance of networking. Wherever he goes, my Dad is always striking up conversations with strangers, building meaningful connections, and networking the hell out of any situation. As a business owner, you have to put yourself (and your brand) out there. To be honest, I let a lot of fear hold me back from marketing my bath and body brand. You have to get comfortable with being uncomfortable to grow your business. Slow days are the perfect time to network your brand, whether that involves reaching out to potential stockists, clients, or customers; organizing collaborations with influencers or other brand owners; setting up meetings with individuals who can help you grow your brand; or looking for local events to attend and network at. Get on google and social media and see who you can start reaching out to. In my opinion, filing taxes as a small business owner can be insanely stressful if you don’t have some sort of system in place. The first year I had to file taxes as a business owner, I kept all of my receipts thrown in several different boxes, and had even more electronically stored in emails or PDFs. When tax season came around I was stressed beyond belief -- I had piles of receipts to sift through, electronic receipts I had to find, and numbers I had to crunch and then put into specific categories. I was literally in tears just a couple days before the deadline because I procrastinated and underestimated how long it would take me to organize my expenses and file my taxes. I’m no expert, but from my personal experience I highly recommend getting yourself as organized as possible, long before tax season rolls around. Once you’re organized, you can get a jump start on filing and start the process ahead of the game. I know for many of us, the thought of tax prep can feel rather overwhelming and almost unbearable, but setting some time aside on a slow day to get organized can make a massive difference in the long run. There are so many facets to running a business and if you’re not outsourcing any aspects of your to-do list, everything falls on your shoulders. This is why spending your slow days, weeks or months creating and scheduling content, or taking care of all the other tasks that typically fall to the bottom of your to-do list is so incredibly helpful. Do you experience a slow season? What do you focus on when things are slower than usual?